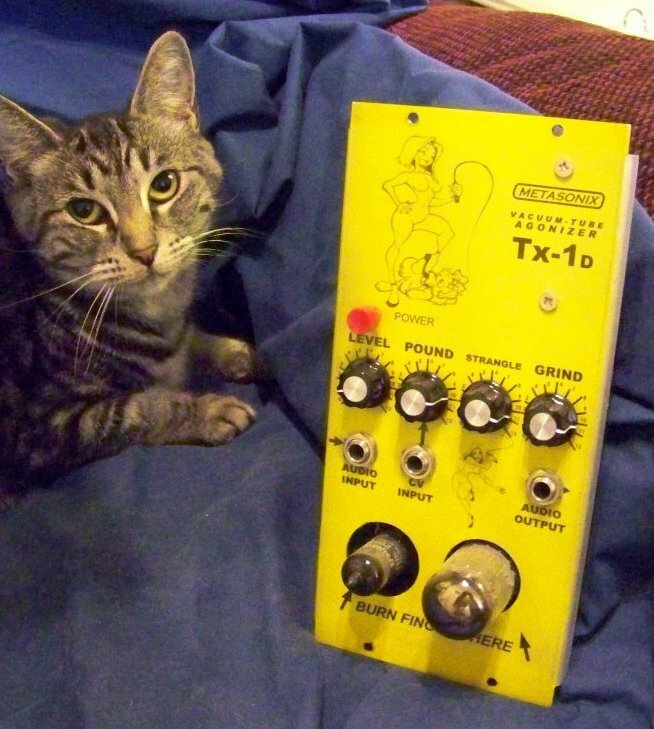 here’s a modulae and a cat, ok. but this one is matesonix and it fits into a standard moog size rack like dotcom, motm etc. and it has „burn your fingers here“ on it. this is the right way to do it, but it is still yellow. which focusses on „weird“ stuff and no synthesizers and claims to be something like the opposite of blogs like matrixsynth, music thing etc., he’s right and I found this module shot there. all ran/run by the guy who builts and created metasonix – so worth a look! and: THERE IS A CAT ON HIS BLOG! whatever it means, maybe it’s a political statement these days, huh?..